Last week all of the students at Idong High School had midterm exams, so I didn't have any classes. I still had to come to school, though, so I tried to spend the week working on lesson plans. I had a moderate amount of success (damn Facebook). The school day was shorter than usual; exams finished up around 1:20pm every day, so the teachers had social plans for every afternoon/evening. First floor teacher lunch one day, tennis club another day, etc. 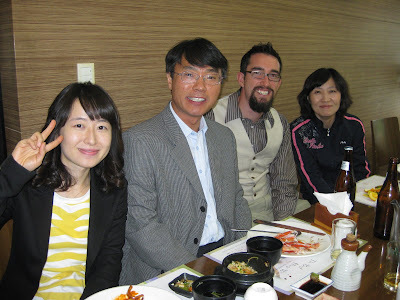 The English department had lunch on Monday afternoon at a sushi buffet. 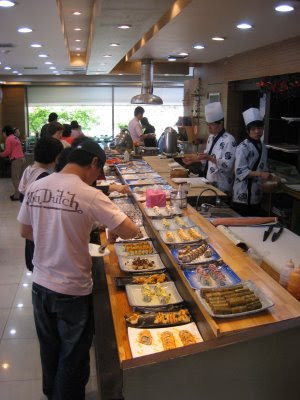 It was awesome - 15,000 won for all you can eat sushi and sashimi. 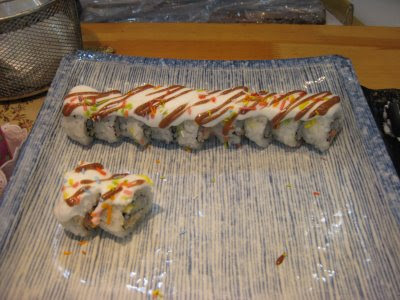 That's whipped cream and sprinkles on a sushi roll. Two of my faves: Mrs. Lee and Miss Hong. Miss Hong has loads of energy and is always laughing and clapping. It's hilarious and contagious. Mrs. Lee is more reserved, but she has a really generous heart. She also smiles shyly when she's nervous in a way that makes me think of puppies and hugs. More faves. 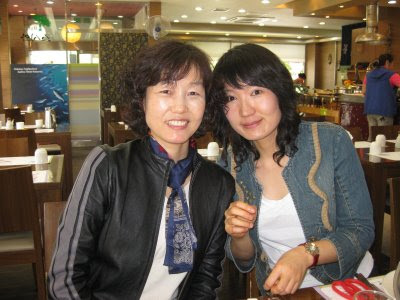 Miss Hwang, Mr. Lee (not Mrs. Lee's husband), Mrs. Yoon. Although I don't actually teach any classes with Miss Hwang (she's 3rd grade), I see her more than almost anyone else. She is very curious about English, and is always coming to my office with questions (instead of "Given that...", can I say "When we are given that..."?). She has also taken it upon herself to teach me Korean. We have class every Friday after lunch, when she quizzes me on the words she taught me the week before. Mr. Lee always explains random bits of trivia to me, like Winter's Envy. 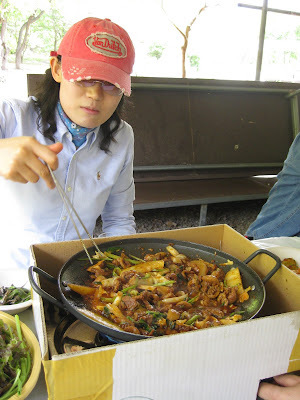 He also loves dog meat, and has taken us out a couple of times for bo-shin-tang (dog meat soup). Mrs. Yoon (Yoon Soon Yung, not to be confused with the other Mrs. Yoon, who I call "Mrs. Yoon with the broken arm", because I can't remember her other names) is my main co-teacher, and is amazing. She is the head of the English department, and is therefore ultra busy, but whenever I ask her a question she stops whatever she is doing at the moment to take care of my concerns. She's a superb sort of adoptive mother. On Thursday we had a school-wide teachers outing. 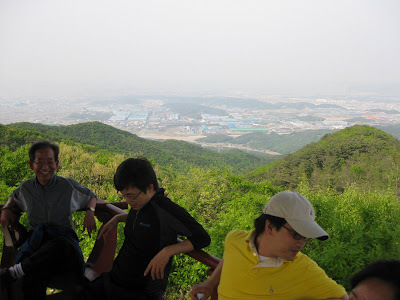 We drove 30 mins outside of Pohang to O-eo-san (O-eo mountain) for lunch and a hike. Everyone carpooled, which was really convenient until some teachers decided to leave halfway through without telling me and almost drive off with all of my stuff in their backseat. We ate at a secluded restaurant, with the place to ourselves. We had a choice between three kinds of bulgogi: Duck, goat, and beef. It definitely wasn't a vegetarian-friendly meal. I chose the duck, and it was delicious. So tender and spicy. We cooked it in the pot and shared it among four people, along with the side dishes and lettuce and mint leaves to wrap it in. After lunch some of us went on a hike, which turned out to be much farther than I expected - about 3 hours round-trip. I thought it would be 1 hour max. The rest of the teachers went home, or stayed behind and gambled and drank. Mr. Hong is my tennis coach. He's also very interested to practice his English with me, though at times it's excruciating watching him smack his head and try to remember simple phrases. His enthusiasm is welcome, though. He really likes me, and always tells me to call him "hyeong nim", which means big brother. He's 32. Halfway into the hike we stumbled upon a temple, high in the hills. 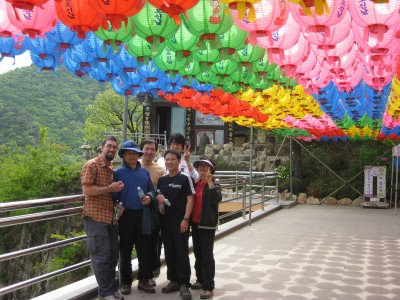 They were getting ready for Buddha's birthday, and had strung up a rainbow of lanterns along the hillside. It was a beautiful, serene atmosphere. 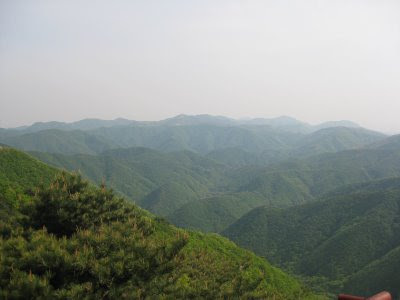 Apparently the mountain was also used as a training ground for the Korean marines. It seemed strange to me that marines would be carrying out ops in the hills behind buddhist temples, but my teachers assured me that there was no combat involved. They also did a lot of trail maintenance - in particularly steep stretches, the marines draped thick ropes up the hillside to assist climbers. 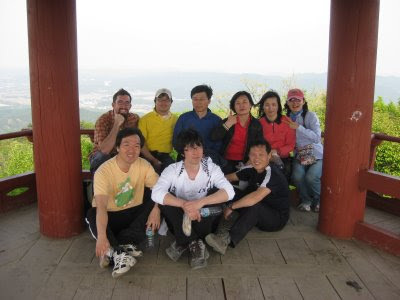 A large gazebo sort of structure sat at the top of the mountain, with stunning, panoramic views of greater Pohang. All of the teachers were in good spirits. We flew back down the hill in half the time it took us to get up. 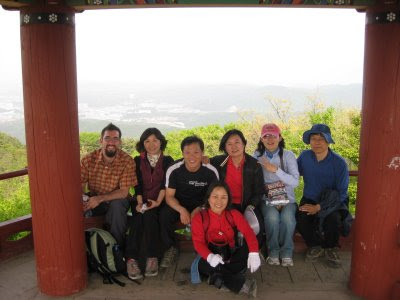 At the bottom of the mountain, we took a few minutes to wander through O-oe-sa (O-oe temple), a famous Korean buddhist temple. 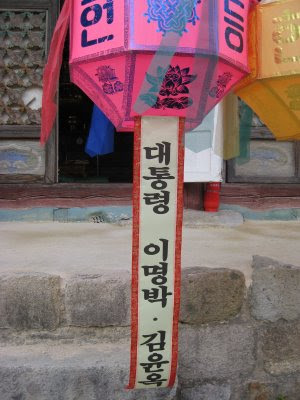 Lee Myung Bak, Korea's President, even sponsored a lantern here. 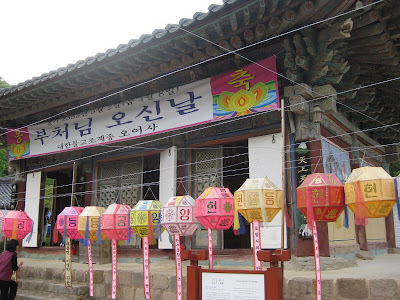 Built during the Silla dynasty, it was rebuilt in 1741. It was a small temple, but seemed to be popular. 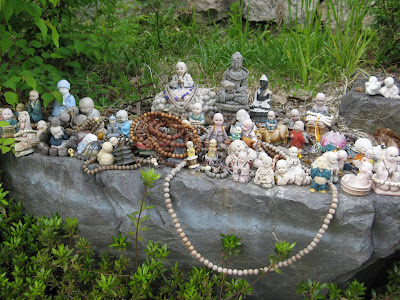 Many visitors would buy prayer beads and drape them over the plethora of Buddha figurines that sat on every available rock face. When we finally got back to the restaurant, the rest of the teachers were good and drunk, and wanted to play Sepak Takraw. 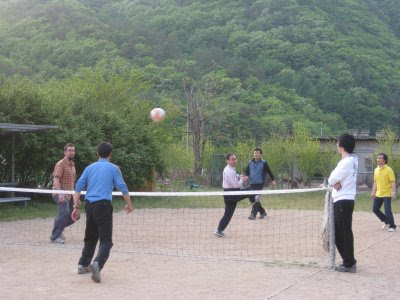 Actually a modified form of the Southeast Asian game, Korean men love to play it on tennis courts. While there are no flips or bicycle kicks involved, I've seen some pretty impressive high roundhouse aces. All Korean men, after all, served two years in the military and spent at least some of their childhood, no doubt, practicing Tae Kwon Do. Most of the teachers, though, could barely walk, much less kick a ball over a tennis net, and the game eventually devolved into what seemed to be a contest to see who could make the wildest, most hilarious attempt to make contact with the ball. It was a long, fun day. The teachers spend so much of their time cooped up in school that when they get the chance to let loose, some of them go hog wild. It's funny to see many of them outside of the school environment, without suits and ties, and for the next several days there is a general bonhomie shared amongst all of the teachers, a silent smile that, luckily for me, doesn't require any words. And you're getting paid money for doing these things! Somewhere I made wrong decisions! Amazed by the Sepak Takraw video; that is neat stuff. I look forward to seeing you display that, and your private tennis coaching results. Has anyone else commented on your homeless/bohemian goatee, or is have you sufficiently dispelled that notion? After exams, then what? More teacher parties? :-) Thanks for sharing. Thoroughly enjoy the photos! some of the kids love the beard, a few don't. 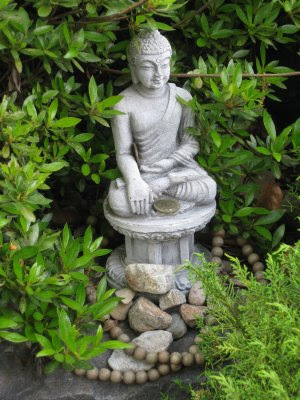 a buddhist monk gave me a thumbs up on it over the weekend. so i've got that going for me. after exams, back to regular classes. @becky: i've got to admit, it's pretty nice. although most teachers here are short-timer young'uns, i've met some who have turned teaching english abroad, over multiple countries, into a career.